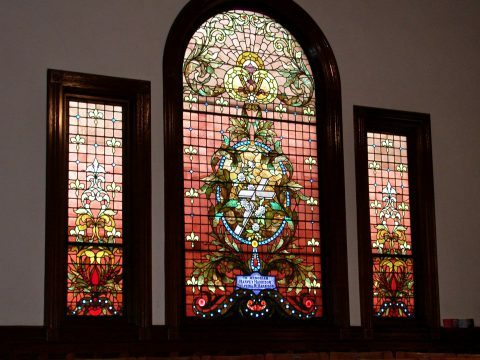 The popularity of stained glass windows in churches reached its height in the 1890's, during the Victorian era, when our church windows were made by one of the leading art glass companies popular at the time - the firm of McCulley and Miles from Chicago. The firm specialized in stained glass and art decoration for churches and public buildings. Many buildings in Chicago dating from the late 1800's contain work by this firm. The large stained glass windows adorn the church on all elevations. The largest of these is the Palladian style three-part stained glass window on the front elevation that features a cross and elements from nature. Palladio was an Italian Renaissance architect of the sixteenth century. The window is accented by many jewels made to imitate precious stones. Its style is Art Nouveau with its curvilinear leaf patterns combined with a classical fleur de lis design. The stained glass windows on the east and west walls have geometric designs combined with floral motifs. The windows in the Parish Hall, adjacent to the sanctuary, interpret nature with floral and bird motifs as well as landscape scenes. Several of the windows are dedicated to the original founders and their families. The windows were ordered from the Chicago firm of McCulley and Miles in 1891.